Phoenix, Arizona is a very hot place. Temperatures are over 104 degrees daily for months. Most people who fly into Phoenix just as quickly escape north to the cooler heights of Sedona and the Grand Canyon rim. However, beyond Alison Dubois, Phoenix can provide quite a bit of entertainment if you delve beneath the heat haze. We undertook one such adventure courtesy of Full Throttle Power Sports. 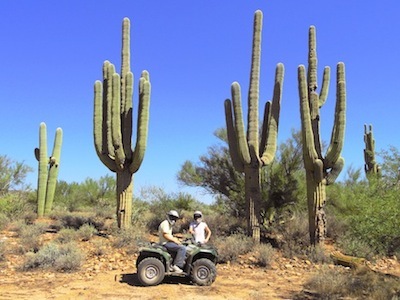 We wanted to see the giant saguaro cactus and Full Throttle has ATV tours into the desert. They also hire out jet skis. So with a little enquiry, we were able to organize a full day tour of quad-biking and jet skiing all inclusive, without the worry of moving equipment and following maps. We arrived in Phoenix on September 29 during an autumn heat wave. The temperature on our tour the next day ended up being over 107 degrees in the shade. But what they say about dry desert heat is actually true — for hardy Australians burdened with heat and overwhelming humidity, this didn’t feel too bad. The ATV tour was first up in the morning before the temperature became extreme. Two hours of riding in the desert through dried creek washes, along narrow winding trails and over some tricky rocky outcrops was truly a thrill. Many of the iconic saguaro cacti lined the route, like sentinels guarding our way. During a drink stop, we heard a rifle being fired. A local was calmly sitting in a picnic chair behind his pick-up truck target shooting. That’s the Wild West for you. After lunch the ATV trailer became a jet ski trailer and we were off on part two of the tour, to Saguaro (keeping with the theme) Lake. There are several lakes in the hills beyond Phoenix and all are used for water sports. content to fly across the waves they were creating. We had a rest stop at a beach further upstream for a swim. The water temperature was surprisingly cool considering the constant heat. It was most refreshing. And there was a strong current, making me wonder where the water was coming from — it’s not like it rains very often. Another stop on the way back was at a rock jutting out of the water, obviously put there by nature to jump off of. By the time we got back to our hotel, it was late afternoon and we were very satisfied, but quite tired. A great day. Well done, Phoenix. We flew to Phoenix direct from Maui with Hawaiian Airlines for $360 each. Flights from Los Angeles start at $72. For lodging, the Best Western at the Mall is an excellent choice with large rooms, free airport shuttle and hot breakfast for $120. Picazzo’s Gourmet Pizza Italian Restaurant in Tempe serves outstanding food. Our Full Throttle adventure cost $800 but they have cheaper tours and rentals available. See www.phoenixatvrentals.com for further details.